It's Etsy's birthday tomorrow and people all over the world are organising Craft Parties. The irrepressible Corrie (aka Retro Mummy) has taken on the task of organising a Sydney event for tomorrow night. The Sydney Craft Party will be held at Notebook magazine's cool new photo studios at Alexandria from 6.30 to 9.30pm tomorrow night, Friday 18th June. There is a cover charge of $20, which includes venue hire and security, a glass of champagne, tea and coffee and a Notebook goodie bag(!). Bring a plate to share, and your craft of course. 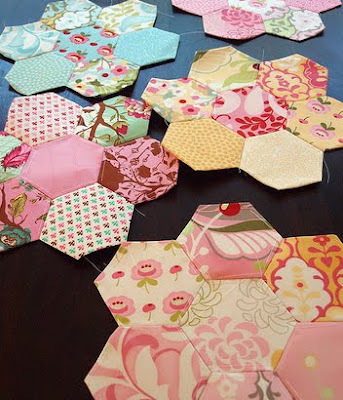 You can BYO craft or bring along fabric scraps to make hexagons and yo yos, as well as scissors, needle and thread, pins etc. It's going to be fun. Please join us if you can. It's a great way to connect and bring to [real]life this amazing online community we have. Tickets must be pre-purchased and are available here. The photo of those lovely hexies is by Retro Mummy.